Susan Petty, “Water Circus,” oil, 5×6 ft.
Marcia Burtt Studio presents “Approaching Abstraction,” a group exhibition featuring landscapes that diverge from realism and emphasize color, shape, texture, and line. Featured artists include Susan Petty, Michael Ferguson, Marilee Krause, Patricia Doyle, Robert Abbott, Anne Ward, and Bill Dewey.Highlighting the exhibition are Susan Petty’s drawings and paintings of waves and eddies. Inspired by Bill Dewey’s photographs, Petty extracts lines and droplets, flattening space. She adds color and painterly brush marks to reveal influences of abstract expressionism, pop art, and Japanese woodblock prints. These paintings constitute a larger metaphor about the influence of art on an artist’s work. Complementing Petty’s drawings and paintings, the gallery will show samples of her inspiration, a selection from Bill Dewey’s Waves series. Small waves attain monumental impact in Dewey’s images of Central Coast surf. Susan Petty, “Meditation III,” graphite,17×27 in. 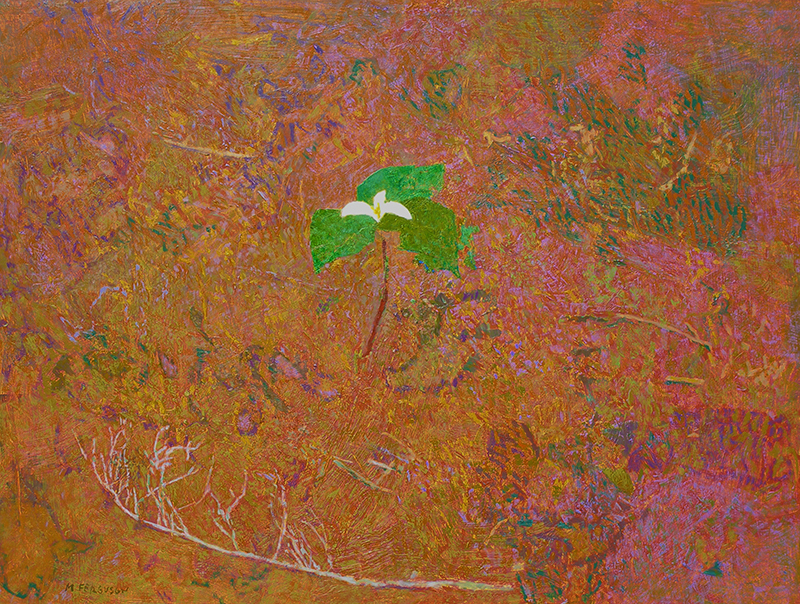 Michael Ferguson, “Trilium,” acrylic, 25×33 in.